Hack24 is just weeks away! We’re super excited here at Cronofy HQ and can’t wait to see you there! A hackathon – a combination of the words hack and marathon if you hadn’t guessed – is an event where tech people get together to code over a period of a few hours, sometimes days. In the case of Hack24, you have 24 hours from the 18th to the 19th of March to enter one of the sponsor’s challenges and create a hack to try to win a prize. We’re a gold sponsor again this year, and our challenge ‘Let’s Rendezvous’ is about helping people get together. Our team of highly-trained developers (their words not mine) will also enter a challenge on the day! A hackathon of any kind can be a gruelling task, but with just 24 hours to create a product, the pressure is really on at Hack24! 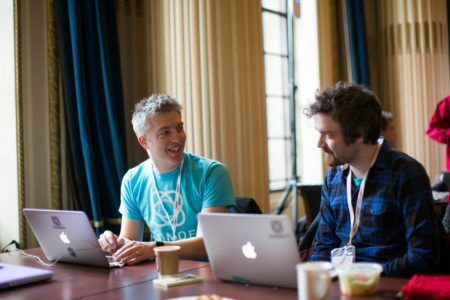 We’ve attended several hackathons – including Hack24 – over the past couple of years, so we thought we’d share some tips that we’ve picked up along the way on how to survive a 24-hour hackathon! When you’ve got a short amount of time to get a lot done, planning is crucial. 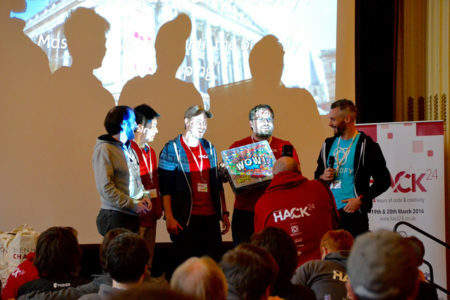 We wrote a guide last year on how to prepare for a hack event, and our advice still stands! The more you plan, the more time you’ll have for coding on the day! You’re allowed to work with up to four people in your Hack24 team, so choose carefully! The more diverse your skills and backgrounds are, the better your chances of success. If you decide to work on separate tasks make sure to catch-up with your team every few hours to ensure everything is still aligned and that everyone is playing to their strengths. There’s nothing worse than getting twelve hours in to find out that two of you have been working on the same thing for the last few hours and you could have spent that time on the crucial presentation! Aim to create something simple then build it into something magnificent. Create a product that will take a few hours to develop then you can spend the rest of the time improving it to show off to the judges. A finished product is better than a polished one, so make sure that what you create is achievable in the time that you have. Simple or small doesn’t have to mean boring, either. 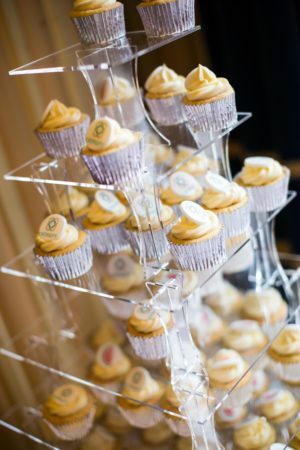 Birthday and wedding cakes are often made using madeira cake, which is notoriously simple, but that simple cake can be used to create everything from BB8 to Hogwarts. If you start working on a product but realize it’s not working a few hours in, don’t be afraid to start again. There’s no point spending your time working on something if you realize early that it is not going to turn out as you planned it. For Hack24 you’ve got to code for 24 hours, then stick around for the presentations and awards. If you factor in travel time and whatever you do before/afterwards, you can be awake for 36 hours or more. Taking a break to have something to eat, get some fresh air or have a power nap can make a huge difference to your productivity levels. You may feel like it puts you behind at first, but you’ll achieve more running at 100% for 16 hours than at 50% for 24 hours. Try something like the Pomodoro technique and set a reminder so that you’re not glued to your station. Staying in the same room for 24 hours can be exhausting in itself. Break it up by going for a short walk outside or around the venue on your own or with your team. It sounds simple, but did you know driving dehydrated is as dangerous as driving drunk? A study done by Loughborough University last year found that when you drive dehydrated your reflexes are on par with when you’ve been drinking alcohol. While you probably won’t be driving during the hackathon, you still need to think clearly, and you can’t do that when you’re dehydrated. If you’re really in need of a break and aren’t from the area, why not check out some of the local pubs and cafes when you go get some fresh air? You never know what hidden gems you’ll discover! Keep a bottle of water by your side and use getting a refill as an excuse to get up and stretch your legs. You can also use this time to stock up on snacks. Hack24 also offers free tea, coffee, water and other drinks throughout to keep you going. When you’re heavily focused on something the hours can go by before you realize you haven’t eaten all day. Don’t do it! Set reminders so that you eat regularly and keep your blood sugar levels up. The lower your blood sugar levels are, the more difficult it is to concentrate. Looks good, doesn’t it? Looks like Garry remembered to eat last year! Power naps are a great tool to give you an energy boost when you’re starting to lag. If there’s somewhere you can go for a quick nap, take advantage! Don’t go past the crucial 20-minute mark though – after that you start to go into REM sleep, and that’s when it becomes harder to wake up and you start to feel groggy. For an extra energy boost, have a caffeinated drink before you fall asleep. Caffeine takes about twenty minutes to get into our system, so drinking something caffeinated before you nap will leave you feeling extra refreshed and ready to go when you wake up! Events like Hack24 are a great place to network. People who’ve met at previous events have gone on to become great friends, worked together and even started businesses together! Explore the room when you can and don’t just stick to your comfort zone. With everything going on around you and everything you have to do it’s easy to forget to enjoy the moment. 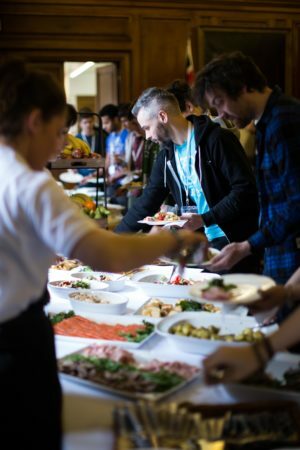 Even if you’re a regular at hackathons, every one is different, so take few moments to sit back, take some photos, and enjoy the atmosphere! Out of all our advice, this has to be the most important! Every hack event is different, so it’s worth taking the time to enjoy it. You’ve worked hard for the last 24 hours and hopefully won a cool prize you want to play with (like the Amazon Echo you could win for winning our Hack24 challenge Let’s Rendezvous), but don’t forget to relax and reflect! You’ve earned it! When you’re all partied out, get an early night to make sure you’re ready for whatever Monday brings. What are your tips for surviving a hackathon? Let us know on Twitter @cronofy or over on the Cronofy Facebook page!